Measures each candidate’s willingness to answer the voter’s questions. National leaders, media and Vote Smart continually ask them to provide answers. When politicians refuse to respond, Vote Smart staff uses their public records to expose their positions. Candidates can change answers at any time they like. 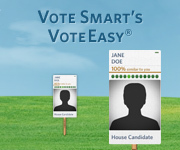 Vote Smart makes it easy to see how well you match up to candidates on the Courage Test with VoteEasy. How are Courage Test issue questions selected? The Political Courage Test is a collaborative effort between Vote Smart and over 200 political scientists, journalists, and leaders from across the political spectrum. The issues included on the Test are the top concerns of the American people and are likely to come up in the next legislative session. They are determined by a rigorous examination of national and local polls, the majority, minority and third party platforms, State of the Union and Response speeches, State of the State and Response speeches, and legislative agendas. Every effort is made to ensure that the test is as unbiased as possible. View the current Political Courage Test forms. Vote Smart does not permit the use of its name or programs in any partisan activity, including advertising. For more information, contact Vote Smart at 1-888-868-3762 or email politicalcourage@votesmart.org.